Talking to someone at a legal clinic is not the same as hiring an attorney, because the attorneys there will not take your case or represent you in court. Going to a legal clinic can help you decide if you can handle the matter on your own, or if you should hire an attorney. By appointment. No appointments between academic terms. Location: Utah State Law Library, 450 South State Street, Room W-13. Phone appointments available. Special Instructions / Additional Information: A student intern helps with OCAP and other court forms, either in person or over the phone. Interns act as scribes, writing or typing information into the forms. They cannot choose the words used, cannot review paperwork, and cannot provide legal advice. Contact: Call 801-238-7990, email library@utcourts.gov, or stop by the law library to schedule an appointment. Appointments are not available between academic terms. Location: Services are provided online. If the client does not have a computer, tablet or phone with internet connection we can help make arrangements to find a suitable location. It is easy to connect. The client opens an email and clicks on the link--nothing to download. The client will be able to see the attorney and law student online along with the document. Special Instructions / Additional Information: Appointment required. Services are provided by volunteer attorneys and law students to help self-represented people prepare divorce and custody court documents. Examples of the documents prepared through the clinic include: Order to Show Cause, Petition to Modify, Temporary Orders, and Petition for Alternate Service. Contact: Call 801-649-8895 to be screened for eligibility, 9:00 a.m. - 2:00 p.m., Monday - Friday. Utah Free Legal Answers is an online service in which volunteer attorneys respond to questions about non-criminal law matters for income-qualified users. Topic: All legal questions welcome, but main topics include family law (divorce, custody, etc. ), elder law, domestic violence situations and victims of crime. Special Instructions / Additional Information: If they cannot help with a question they will refer to someone who can help. Contact: Call the hotline at 801-649-8895 with questions, or to ask for more information. Special Instructions / Additional Information: No appointment necessary. Contact: Call 435-723-5600 to check for scheduling changes. Location: RJ Law Center 75 West Main St.
Special Instructions / Additional Information:Self-represented petitioners with protective order hearings that day can meet with volunteer lawyers at 8:30 a.m. who are able to represent them at the protective order hearing for free. Spanish interpreters available on request. Special Instructions / Additional Information: No appointment necessary. Spanish speakers almost always available. Contact: Call Taylor Roe at 435-787-9700 to check for scheduling changes. Contact: Call 801-655-0258 to make an appointment, or visit the IRS Utah LITC website for more information. Topic: Answers questions related to immigration, such as citizenship, status, deportation, visas and family law. Special Instructions / Additional Information: By appointment only. Offers mediation for those involved in small claims cases, as well as various relationship disputes, including neighbor, workplace, family and interpersonal, consumer and marketing, landlord and tenant, business, and school. Statewide services may also be available. Contact: Call Utah Dispute Resolution at 801-689-1720 or 801-532-4841 to schedule an appointment. Location: Your Community Connection (YCC), 2261 Adams. Special Instructions / Additional Information: Appointment required. Only about 15 people are seen each session. Please note that visiting attorneys will provide information, but will not take on clients. Contact: Call 801-394-9456 after 8:00 am on the day of the clinic. Call early; appointment slots fill quickly. Special Instructions / Additional Information: Clinic is only for cases that have been already filed. Free mediation services offered through trained volunteer mediators. Contact: Call 435-615-3800 for more information. Location: Park City Library, 1255 Park Ave.
Special Instructions / Additional Information: Must be present by 6:45 in order to participate. Contact: Call 435-615-5600 for more information and for scheduling changes. Topic: General civil matters, including immigration, landlord-tenant and debt collection. No family law. Special Instructions / Additional Information: Volunteer attorneys and law students working under their direction give advice and referrals, and in some cases provide representation. This clinic serves low income individuals, but there is not a strict income cutoff. No appointment is needed, but appointments can be made. 9:00 a.m. to 5:00 p.m. Saturdays by appointment. Location: Centro Hispano, 817 South Freedom Blvd. Special Instructions / Additional Information: Low income taxpayers who cannot afford professional tax assistance during audits of their federal income tax returns may qualify for help from Low Income Taxpayer Clinics. Contact: Call 801-655-0258 or email sherrya@centrohispanouc.org for more information, or visit the IRS Utah LITC website. Every Tuesday night from 5:00 to 8:00 p.m. except holidays and the last two weeks of December. Special Instructions / Additional Information: Free walk-in clinic. Volunteer attorneys and law students working under their direction are available to give advice and referrals. This clinic is part of the Family Justice Center which provides a variety of services from various local agencies which may include Community Action, Victims Assistance, Centro Hispano, and Division of Child and Family Services. Income must be below 200% of the federal poverty guidelines. No appointment is needed. Clients are served on a first come-first served basis. First Wednesday of each month, 2:00 p.m. to 3:00 p.m.
Second and Fourth Thursday of each month, 1:30 p.m. to 2:30 p.m.
Special Instructions / Additional Information: Must be 60 or older. Volunteer attorneys provide legal consultations. Appointment required. Contact: Contact the senior center at 435-634-5743 for more information. Special Instructions / Additional Information: This program offers free 15-minute consultations. By appointment only. You must be screened for this clinic through Utah Legal Services. Please see information about Utah Legal Services' eligibility requirements. Contact: Call 800-662-4245 x3662 to schedule. Special Instructions / Additional Information: Clinic is first come, first serve, so arrive early. Contact: See www.representveterans.com for more information. Call 435-634-7608 to check for schedule changes. Topic: Issues related to the Indian Child Welfare Act, tribal land, family claim issues. Topic: Family law cases such as divorce, paternity, custody, and minor guardianship cases. Special Instructions / Additional Information: Legal Aid Society of Salt Lake provides free legal advice appointments to income eligible people representing themselves. Appointment required. Contact: Call 801-238-7102 to schedule an appointment. Special Instructions / Additional Information: Offers mediation for disputes in various relationships, including neighbor, workplace, family and interpersonal, consumer and marketing, landlord and tenant, business, and school. Statewide services may also be available. Special Instructions / Additional Information: Sponsored by: S.J. Quinney College of Law's Pro Bono Initiative. Contact: See website for any upcoming closure dates: http://www.law.utah.edu/pro-bono-initiative/free-legal-clinics/ or call 801-240-1442. Special Instructions / Additional Information: Sponsored by: LDS Charities and S.J. Quinney College of Law's Pro Bono Initiative. Topic: Bankruptcy, debt collection, credit issues, and identity theft. Special Instructions / Additional Information: Must arrive at least 30 minutes prior to closing time in order to be seen. Co-sponsored by the Utah State Bar, Utah Legal Services and the Pro Bono Initiative of the S.J. Quinney College of Law. Topic: Impediments to employment, such as expungements and addressing issues regarding outstanding warrants only. If you have other employment law issues, please attend the Street Law Brief Advice Clinic. Special Instructions / Additional Information: Arrive no later than 6:30 p.m. The building closes promptly at 7:00 p.m. Sponsored by: Utah Legal Services and S.J. Quinney College of Law's Pro Bono Initiative. Please see information about Utah Legal Services' eligibility requirements. Topic: Family law, child custody, divorce, protective orders and guardianship. Location: Scott Matheson Courthouse, Room W-19, Conference Room A, 450 South State Street. Special Instructions / Additional Information: Must arrive at least 30 minutes before closing time in order to be seen. Open to any low income Utahn on a first come, first served basis. Income screening required. No appointments. Staffed by volunteer lawyers, legal professionals and law students. Sponsored by: Legal Aid Society of Salt Lake, S.J. Quinney College of Law's Pro Bono Initiative and the Family Law Section of the Utah State Bar. Monday-Friday, 4:00 to 6:00 p.m.
Special Instructions / Additional Information: Drop in or by appointment. Available to homeless youth ages 15-22. Topic: Meant for individual inventors seeking high-level patenting advice, small business owners just starting a business seeking trademark advice, or authors/artists seeking high-level copyright advice. Special Instructions / Additional Information: For an individual inventor, the attorney can explain the benefits of filing a provisional patent application as a micro-entity before seeking investors, and provide an overview of the patenting process. For a small startup business owner seeking trademark advice, the attorney can explain the purpose of trademarks, the protection offered, and provide an overview of the process to obtain a trademark. For an artist or author curious about copyright protection, the attorney can provide an overview of the copyright process with a discussion of when it might be desirable to register the copyright on a particular work. Must arrive at least 30 minutes before closing time in order to be seen. No appointment necessary. Sponsored by: Utah Legal Services and S.J. Quinney College of Law's Pro Bono Initiative. Special Instructions / Additional Information: Deaf and Hard of Hearing only. 30-minute advice only appointments with Utah Legal Services representatives. ASL interpreters are provided. If additional accommodations are needed, please request it when making your appointment. The clinic is available to those who qualify; each client must fill out eligibility forms before getting appointments. Please see eligibility requirements at https://www.utahlegalservices.org/ under "Get Help"
Contact: Contact staff at 801-657-5209 and 801-657-5200 (front desk) or lauriebishop@utah.gov to schedule an appointment. Appointments are also available through video phone. Thursdays and Fridays by appointment. Topic: Heath care and accommodations, as well as housing and family law. Special Instructions / Additional Information: Appointments can be made after your health check-up. Sponsored by: Utah Legal Services, S.J. Quinney College of Law's Pro Bono Initiative, South Main Health Center, and the University of Utah's Health Sciences Residency Program. Not offered November 28 or December 26. Topic: LGBT-related (Lesbian, Gay, Bisexual and Transgender) employment, estate planning and family law issues only. Special Instructions / Additional Information: Must arrive at least 30 minutes before closing time in order to be seen. Open to low income Utahns on a first come, first served basis. Bring all documents relating to your issue such as contracts, pay stubs, court documents, and emails. Sponsored by: Utah Legal Services, S.J. Quinney College of Law's Pro Bono Initiative, The Outlaws, and the Pride Center. 8:30 a.m. to 5:00 p.m..
Topic: Family law matters only. Location: Scott Matheson Courthouse, Room W-15, 450 South State Street. Special Instructions / Additional Information: Staffed by Legal Aid Society paralegals experienced in domestic law. No legal advice given. No appointment necessary. Special Instructions / Additional Information: Class covers starting a small claims case, preparing for trial, and what happens at trial. Taught by small claims pro tempore judges. Topic: General criminal and civil matters. No immigration or bankruptcy. Special Instructions / Additional Information: No appointment necessary. First come, first served. Contact: Call 801-363-7710 for schedule changes. Topic: General civil topics, such as consumer issues, employment, housing, discrimination, etc. No family law or criminal law. Special Instructions / Additional Information: Must arrive at least 30 minutes before closing time in order to be seen. No appointment necessary. Sponsored by: Utah Legal Services and S.J. Quinney College of Law's Pro Bono Initiative. Special Instructions / Additional Information: For victims of Domestic Violence. By appointment only. Appointments must be made before 4:00 P.M. on the Tuesday prior to the appointment. Language line available. Contact: Call 801-236-3370 to request an appointment. Utah State Bar's "Tuesday Night Bar"
Appointments start between 5:30 and 7:00 p.m.
Special Instructions / Additional Information: Appointments are required and must be made 8 days prior to Tuesday meeting. Scheduling begins Mondays at 1:00 pm until full. Contact: Call 801-297-7037 to schedule appointment. Contact: See www.representveterans.com for more information. Call 801-872-8382 to check for schedule changes. Special Instructions / Additional Information: A YWCA guide helps fill out protective order and civil stalking injunction forms. Spanish and Arabic speakers available; ASL interpreter available by appointment. Help in other languages may be available. Contact: Salt Lake Area Family Justice Center: 801-236-3370; Crisis Line: 801-537-8600. Special Instructions / Additional Information: Provides mediation services to landlords and tenants involved in eviction proceedings in the Salt Lake County area using trained volunteer mediators. This program is a collaboration between the Community Action Program and the Utah State Courts. Special Instructions / Additional Information: Available during small claims court in Salt Lake County. Free mediation for those currently involved in small claims cases, offered through trained volunteer mediators, in collaboration with Utah Dispute Resolution. Contact: Call Utah Dispute Resolution at 801-532-4841 for more information. Holladay Justice Court: First, third and fourth Thursday of each month at 8:30 a.m.
Sandy Justice Court: First and third Tuesday of each month at 2:00 p.m.
Special Instructions / Additional Information: Available during small claims court in Salt Lake County. Service provided by trained volunteer mediators in collaboration with BYU's J. Reuben Clark Law School. Special Instructions / Additional Information: Volunteer attorneys provide 20 minute legal consultations to senior citizens at Salt Lake County senior centers by appointment. Contact: Call your local senior center or the Utah State Bar at 801-297-7049 for more information. Special Instructions / Additional Information: Available during small claims court in Utah county. Service provided by trained volunteer mediators in collaboration with BYU's J. Reuben Clark Law School. Contact: Call 801-369-0320 for more information..
Special Instructions / Additional Information: Volunteer attorneys and law students working under their direction are available to give advice and referrals. This clinic is part of the Family Justice Center which provides a variety of services from various local agencies which may include Community Action, Victims Assistance, Centro Hispano, and Division of Child and Family Services. Income must be below 200% of the federal poverty guidelines. No appointment is needed. Clients are served on a first come-first served basis. Special Instructions / Additional Information: Available during small claims court in Wasatch County. Service provided by trained volunteer mediators in collaboration with BYU's J. Reuben Clark Law School. Contact: Call 801-369-0320 for more information. Clinics sponsored by Utah Legal Services (ULS) are designed to help low-income Utahns; you must qualify under their guidelines to get help. ULS recommends that you go through their intake process by phone (801-328-8891, 1-800-662-4245 or 1-800-550-4182 (TTY)) or online to see if you qualify before going to a ULS-sponsored clinic. 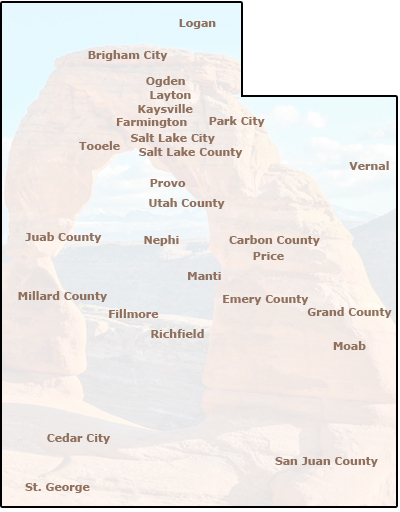 Some Utah organizations provide legal services for free, or at reduced rates. Many of these organizations look at a person's income to determine whether they qualify for those services. American Civil Liberties Union: This nonprofit legal advocacy organization only litigates cases that affect the civil rights or liberties of large numbers of people. The ACLU does not provide direct representation to individuals, unless there is potential to set precedent for civil liberties issues. See their website for information about the types of cases they can review, or call 801-521-9862 ext. 104 to request a civil rights complaint form. Disability Law Center: This private, non-profit organization protects and advocates for the rights of individuals with disabilities. Free services are provided statewide to individuals and families facing disability-related problems, especially in the areas of access and rights, abuse and neglect, education, community services, assistive technology, institutional care, and employment. Services include information on disability law and individual rights, investigation and monitoring in residential facilities; mediation and negotiation; representation in administrative hearings and court proceedings; and self-advocacy support and training. Call 800-662-9080 for assistance, fill out the online intake form found here: http://disabilitylawcenter.org/online-contact-form/ or visit their office at the Community Legal Center, 205 North 400 West in Salt Lake City. Legal assistance in immigration cases is provided, regardless of religious affiliation, to eligible applicants, on a sliding scale fee basis. Appointment required. Contact Susana Acero at 801-261-3440 ext 748. Legal assistance with immigration matters is provided, regardless of income or religious affiliation. Flat fees are charged, which vary by case type and complexity. Fees may be waived for exceptional financial hardship. Walk-in consultations are available Wednesdays 8:30 a.m. to Noon and 1:00 to 5:00 p.m. at 754 East 300 South in Salt Lake City, or call to make an appointment. For more information or to make an appointment, call 801-977-9119 between 8:30 a.m. and 5:00 p.m., Monday through Friday. International Rescue Committee : A certified immigration specialist offers low cost assistance with basic immigration services, including adjustments of status, petitions for family reunification, and applications for naturalization, travel documents, and employment authorization. For more information, call 801-328-1091 from 9:00 a.m. to 5:00 p.m., Monday through Friday. Legal Aid Society of Salt Lake is private, non-profit organization that provides free legal representation in Salt Lake County - regardless of income - to victims of domestic violence or stalking who need a protective order or a civil stalking injunction. They also provide representation for low-income individuals in family law cases such as divorce, paternity, custody, and minor guardianship cases. There is a client fee of $200-$600 for family law cases, depending on income. Native American Disability Law Center: Provides legal information, referrals, and legal representation on disability-related issues to Native Americans in the four corners region of Arizona, Colorado, New Mexico and Utah. Call 800-862-7271 for more information. The Never Again Foundation provides legal assistance to families of victims killed by domestic violence. Their mission is to prevent killers from financially profiting from causing death. They provide holistic legal services in probate, civil and family law cases to families of domestic violence murder victims. Visit their website or call 801-500-9077 for more information. Rocky Mountain Innocence Center: Works to correct and prevent the conviction of innocent people in Nevada, Utah, and Wyoming. Prisoners or their friends or family may contact the RMIC for a screening packet: 358 South 700 East, B235, Salt Lake City, UT 84102 or go to their website. Call 801-355-1888 for more information. Small Claims Court Mediation Programs provides mediation services to disputants in small claims cases, prior to court. These programs are available in Salt Lake County, Provo (Utah County), and Park City (Summit County). For more information, contact the numbers given under program descriptions listed above, under the headings for Park City, Provo, and Salt Lake County. University of Utah Low-income Taxpayer Clinic: Represents low- and moderate-income individuals in tax disputes with the IRS. The Clinic also provides community education about tax law to low-income groups, English language learners, and agencies that serve these populations. Spanish speakers available. S. J Quinney College of Law, University of Utah, 383 South University Street, Salt Lake City. Email utahtaxclinic@law.utah.edu or call 801-587-2439 to seek services. Utah@Ease provides free legal help for veterans, active duty, national guard and reserve servicemembers. They can help with these issues: military rights, creditor/debtor, naturalization/immigration, employment and re-employment, property/landlord, consumer fraud, predatory lending, wills/powers of attorney. Veterans should contact their local veterans service officer (UDVMA, DAV, VFW, American Legion) for a referral. Active duty, national guard and reserve servicemembers should contact their JAG office. Utah Crime Victims Legal Clinic (UCVLC): This organization provides free legal representation to crime victims when victims' rights issues are at stake. UCVLC serves victims of all types of crime in criminal district, justice, juvenile, and appellate courts throughout the state. Visit their website or call 801-746-1204 for more information. Utah Dispute Resolution: With the help of volunteer mediators, this non-profit organization provides mediation services free or at low cost to people and organizations in the community. No one is denied service because of inability to pay. Some areas of mediation service include divorce, parenting time and plans, landlord and tenant, workplace, and consumer and merchant issues. Bilingual mediators are available in several languages. Mediation is a problem-solving process used to resolve disputes between two or more parties, with the help of an impartial and neutral third party (the mediator). Call 801-532-4841 for information, or visit UDR offices at The Law and Justice Center, 645 South 200 East, in Salt Lake City. Utah Legal Services: This organization handles civil cases for Utahns with low incomes, and for migrant farm workers and Native Americans. Areas of assistance include family law, housing, public assistance, senior citizen issues, and health benefits. Services include answering questions, providing legal advice, assisting with the preparation of legal documents, and representing clients in court. For more information, call the intake line at 1-800-662-4245 or, if dialing from within the Salt Lake City area, call 328-8891. Intake is available in Spanish, as well as English. Normal intake hours are 9:00 a.m. to 2:00 p.m., Monday through Friday. Offices are located in Salt Lake, Ogden, Provo, and St. George.